MOT regulations are now more stringent than ever, especially for older, smoky diesel vehicles. Millers Oils believes it has a solution that can clean customers’ fuel systems, restore performance and efficiency, and even help pass those frustrating MOTs. The MOT regulation updates introduced last May have been bad news for cars that have previously only just passed under the old test. In fact, according to Yorkshire-based specialist lubricant and treatment manufacturer, Millers Oils, since the updated test came in, diesel emissions-related MOT failure rates have increased by an incredible 311%. The focus on emissions and reduced tolerance of vehicles deemed to be ‘dirty’ is unwelcome news for older diesel cars, or those equipped with a DPF. Any visible smoke from a DPF-equipped vehicle is an immediate fail, and unit replacement is not cheap. The purpose of EPP, says Howe, is to help keep cars running reliably for longer, minimising the risk of breakdown or, crucially, exposure to potentially costly MOT fails. “EPP provides garages with an opportunity to build customer loyalty and encourage word of mouth recommendation. 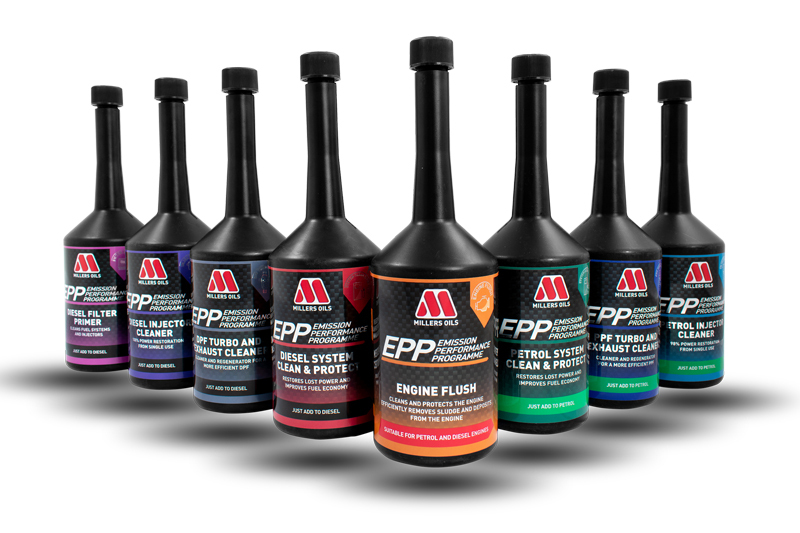 EPP complements existing service schedules and can be used to help clear blocked injector nozzles, contaminated fuel pumps, soot build-ups or oil sludge formulation, all of which impact engine efficiency and can result in increased harmful emissions. The EPP products are used to clean the entire fuel and oil system, and can restore lost power, reduce harmful emissions and improve car performance, all without the need for expensive tools, equipment or component replacement. “EPP provides garages with the opportunity to offer customers that ‘just serviced’ feel, which has disappeared since modern fuel injection and ignition systems replaced carburettors, plugs and points,” says Howe. “It also provides assurances that MOT time will be less stressful.